The slow cooker eMeals meal plan feeds a family of 6, and generally costs around $120 per week (or less). That’s only around $2.86/person per meal! For those of you with smaller families, there’s also a 2 person plan available. The recipes use mainstream ingredients, all available at your local grocery store, and appeal to a broad range of tastes. It's a great plan for the busy person who wants to be fed well but is short on time. You have a hot meal waiting for you in the slow cooker every day and all it takes is a little preparation. 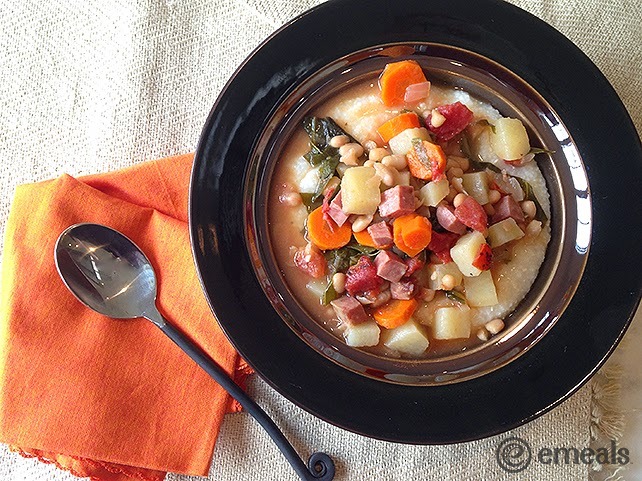 Ham, Kale and Navy Bean Stew served over hominy Cheese Grits, and appears on this week’s Slow-Cooker Classic Meal Plan. The eMeals team devoured the leftovers for lunch, and it will freeze perfectly. Take a look - you can join eMeals free for 14 days Click here to sign up. *I enjoy adding a bit of hot sauce and a few pinches of Italian herbs to mine! *I like to add lots of white or black pepper to mine!